Nagase & Ray is a Italian motorcycle company founded in Milan in 1925. The company "Nagase & Ray" was born at the end of World War I on the initiative of Alexander Nagase and Tullio Ray, in order to import and market in Italy foreign manufactured vehicles. Especially American vehicle production, very well known and appreciated for the substance of the large military supplies sent by the United States in Europe. The company obtained the exclusive for Italy from "Ford Motor Company of Detroit in the car, as well as" Indian Motorcycle Company "by Springfield and Zündapp "by Nuremberg for motorcycles. Given the response of the market, in 1925, members decided to set up a factory of motorcycles and, in order, recruiting one of the best technical motor Italians, Ing. Joseph Remondini, "ripping" to "Frera" which, in turn, had "blown" the Alfa Romeo. 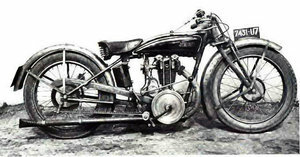 Remondini it to them immediately to design the new bike, which will be presented at the end of 1925 and put out to tender in the second half of 1926. This is a car with a tubular chassis cradle and a parallelogram front fork, driven by a 350 cc single-cylinder with side valves distribution to fly outside and forced lubrication. The change is blocking three reports and the start-up kits. Versions is given in "Normal" and "Sport", differentiated only from the drive and some superstructure. In 1927, Remondini began designing a new engine valve in the head, in order to equip the "sport" with a vehicle suitable to the expectations of customers. Announced with a strong press campaign, the new engine began testing bench at the end of 1928. But the clouds of "Great Depression" are appearing on the horizon. In November 1929, after the "Black Thursday" on Wall Street, the relationship with Ford and Indian becomes difficult. Before long, Alessandro Tullio Nagase and Ray decided to retire by the company, leaving Remondini the opportunity to continue, assuming the economic burdens. It is an effort that an employee, albeit well-paid, can not bear, but not discouraged Remondini and calls for the intervention of Jonghi Tito, an Argentine fan of industrial engines. Thanks to the entry of capital "fresh" in the 1930 will continue production that will be marketed under the brand name "Jonghi." The company will be moved to France in 1932.